Title: The most lamentable Romaine tragedie of Titus Andronicus As it was plaide by the right honourable the Earle of Darbie, Earle of Pembrooke, and Earle of Sussex their seruants. Date: London : Printed by Iohn Danter, and are to be sold by Edward White & Thomas Millington, at the little North doore of Paules at the signe of the Gunne, 1594. The most lamentable Romaine tragedie of Titus Andronicus As it was plaide by the right honourable the Earle of Darbie, Earle of Pembrooke, and Earle of Sussex their seruants. London : Printed by Iohn Danter, and are to be sold by Edward White & Thomas Millington, at the little North doore of Paules at the signe of the Gunne, 1594. This is the only known surviving copy of the first edition of Titus Andronicus, published in 1594. 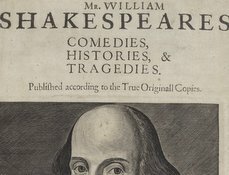 Titus was the first play by Shakespeare to be published. One of Shakespeare's bloodiest plays, Titus Andronicus racks up a body count quickly and, perhaps not-so-coincidentally, achieved a popularity to match. The title page, indicating that it was "Plaide by the Right Honourable the Earle of Darbie, Earle of Pembrooke, and Earle of Sussex their Seruants," is unusual in that it mentions three different companies of players to have performed it. 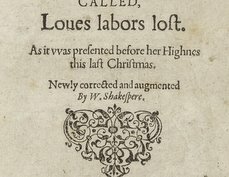 Shakespeare's name is not given on the title page, which was not unusual at the time. 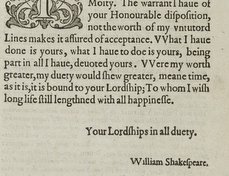 Some contemporaries certainly knew who wrote it, since Francis Meres lists it among Shakespeare’s tragedies in Palladis Tamia in 1598. For centuries, the first edition of Titus was thought to be lost. This copy surfaced in 1904, in Sweden, at the home of a postal clerk. Joseph Quincy Adam’s published 1936 facsimile of the quarto states that the postal clerk reportedly saw a newspaper article about the sale of an early English Bible for an impressive sum of money, and it made him think of the worn little English book he had in his own collection. On the chance that the book might be authentic, Henry Folger purchased it through one of his London agents for the tremendous sum of £2000. The book had earlier been bound using endpapers consisting of handbills advertising an eighteenth-century Swedish lottery; the original quarto's paper binding was glued to these endpapers. The endpapers add to the mystery surrounding the quarto, and they have been preserved in subsequent rebindings and conservation efforts. 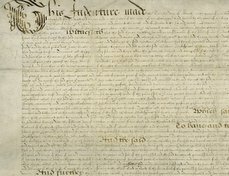 At first, in order to preserve Mr. Folger's anonymity, sales records simply said that the book had been purchased for "stock" by the bookseller serving as Mr. Folger’s London agent. When news of this purchase became public at the beginning of 1905, it became major news in Sweden, Britain, and the United States. The Swedish press was astounded that one of their countrymen had unearthed such a rare and important find; the British press was dismayed that such a find was not going to remain in Britain, but was being "exported" to the States; and the U.S. press was thrilled by the acquisition. No other copy of the 1594 edition has yet been found. David Farley-Hills, "The Date of Titus Andronicus," Notes and Queries 47, no. 4 (2000), 441-44. William Shakespeare, Shakespeare’s Titus Andronicus: The First Quarto, 1594, ed. Joseph Quincy Adams (New York: Charles Scribner’s Sons, 1936).